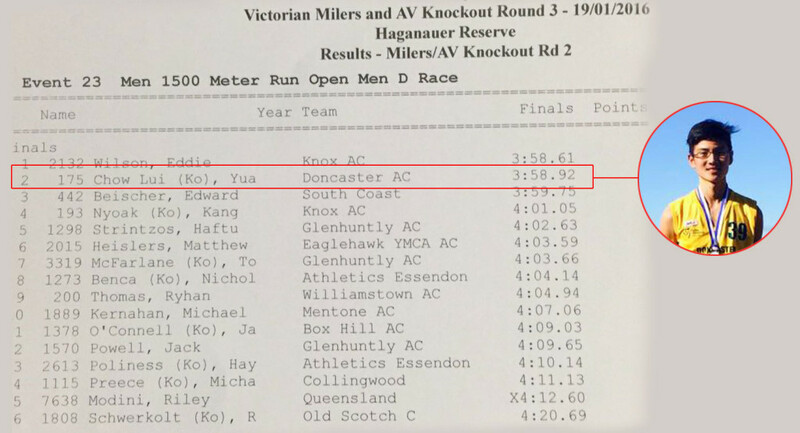 At a local meet in Australia, Lui Yuan Chow who resides & studies Down-Under, became the first Singapore youth schoolboy to run a sub-4 minute in the 1500 metres event. The performance is also a new National Youth & Junior Record. The 17-year-old ran 3:58.92 minutes at the Victorian Milers meet today earlier. Lui’s previous best was 4:02.47 minute set last December. He also set the 3000m (8:50.05min) National Youth Record last November. The effort ranked him 12th on the all-time list for men 1500 metres event. The last time the Republic had an athlete running a sub-4 minute in the 1500m metres was back last year, when Muthu Kumar, Raviin ran 3:56.96	minutes at the SEA Games.